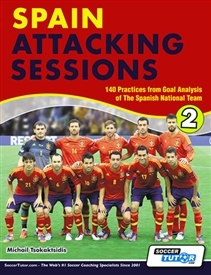 This top class book in FULL COLOUR - Spain Attacking Sessions is the 2nd in a series of books which provide you with a blueprint of how to attack and score goals like the world’s best teams. Michail is a UEFA ‘A’ license coach and has provided a full and extensive analysis of the Spanish National Team's best goals during the 2008-2012 period when Spain won Euro 2008, the World Cup 2010 and Euro 2012. This goal analysis has been used to produce 31 ready-made sessions (140 practices) including: functional technical practices, patterns/phases of play, possession games, transition games, opposed/unopposed zone play and small sided games. You, the coach, can learn how to train your team in the same style as Spain and adapt your own training methods to produce outstanding results. Learn How to Attack and Coach Your Team to Play Like "The Best National Team in the World"
A This book includes chapters on how to play in all the different phases of the game and against various different oppositions and formations. The first 3 chapter are based on attacking against teams which defend in the low, the middle and the high zone. 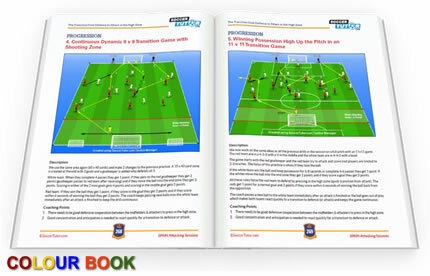 Chapters 4, 5 and 6 focus on the transition from defence to attack in the low, middle and high zone. conquered all before them. The period in which all these goals were scored was 2008-2012 (official competitive games) when Spain won Euro 2008, the World Cup 2010 and Euro 2012. I think this is a book which provides content that has not been produced before. We have combined a comprehensive analysis of the phases of play which lead to goals with training exercises that can be used for coaches to train the same tactical situations used with many formations such as the 4-4-2, 4-3-3, 4-1-4-1 and 4-2-3-1. 1. We analyse Spain’s tactics and the phases of play which lead to their best goals and work on how to recognise and find solutions against different opposition’s formations and various tactical situations. 2. We created specific practices to train how to apply the same objectives to your team and achieve the same results. This book is excellent in the way it was done. You have analysis followed by sessions to practice the plays in the analysis. Although the book deals with Spain's 2008 Euro and 2012 Euro, as well as the 2010 WC, the training is still a different way of training for the amateur and club leagues. One thing I found interesting is how the book is written to attack and defend according to the system of play of the opponent, as in "low zone" mid zone" and high zone" Very complete, and yet, it allows for one to enhance some and certain drills. Indeed, a good investment! This book was great for me to take my coaching to next level for the 11,aside game. Well illustrated and explained well. Could do with more coaching points and their is some duplication. But well worth the money. Well done to the author.